Something I found most interesting was the difference between Page post impressions and views of other Facebook Page assets (Timeline and tabs). I took data from the past 89 days (the largest time period you can view within web Insights) and found the per day averages. Quite the difference, eh? You can barely even see the bar that represents my Timeline and tab views. Plenty we can make of this, the first of which is that your primary focus should always be on the News Feed of your Fans. While tabs and your Timeline are important, it represents 1.5% of my post impressions (which does include views of those posts on News Feeds, Tickers and my Page Timeline). Make sure to read the article since this is just one of several discoveries that I made. 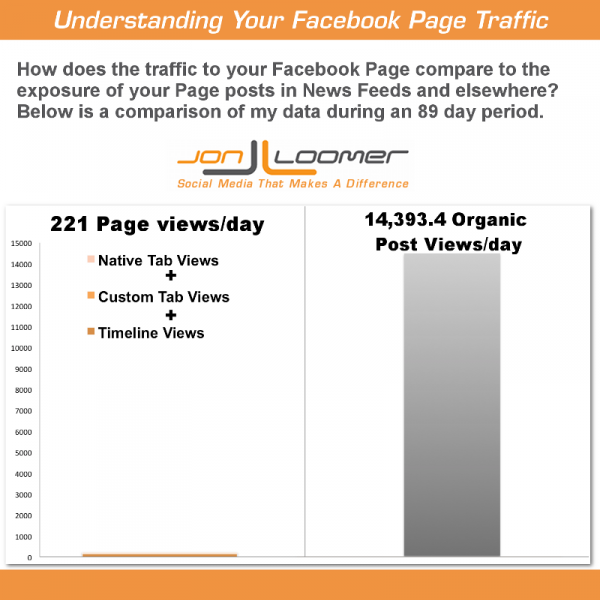 How do the numbers compare for your Page?